Click here to see all of the previous posts! 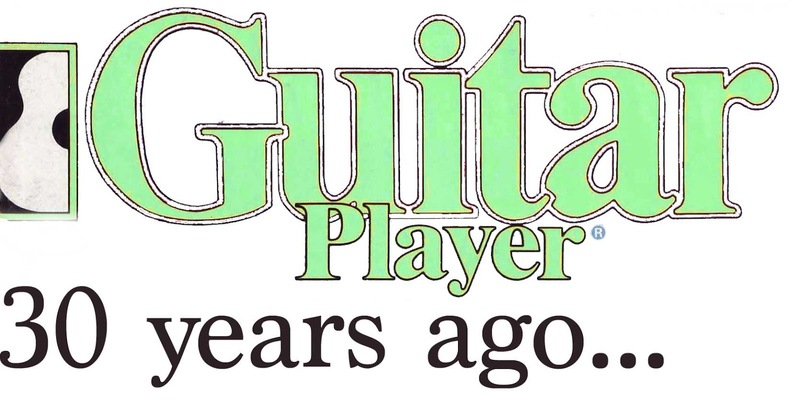 The May 1988 issue seems to be chock full of the kind of variety that made GP so great back in the day, especially for a young person still learning about music, musical genres, and the instrument itself. 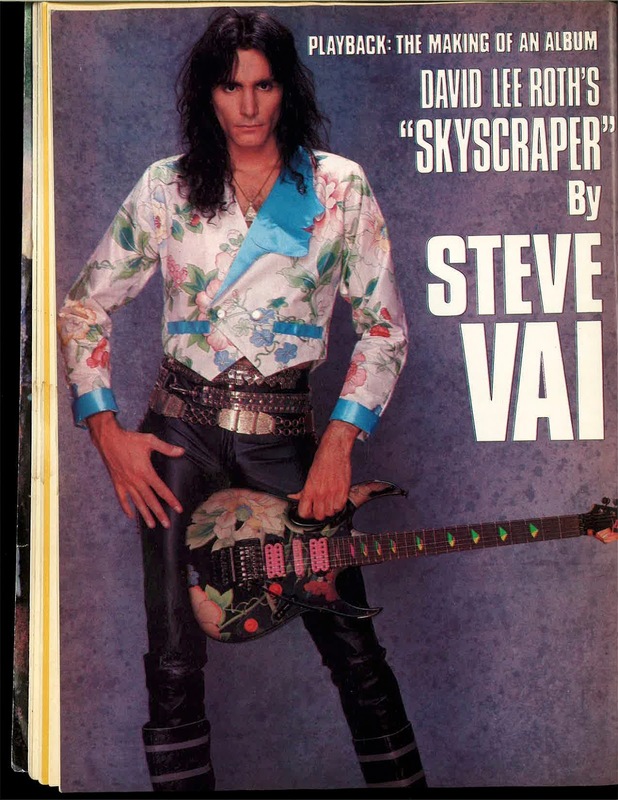 I was already a fan of cover artist Albert Collins (I owned a “Master of the Telecaster” t-shirt) and watched MTV’s “Headbanger’s Ball” every weekend so I was certainly interested in what Steve Vai had to share about recording David Lee Roth’s latest album. But the country picking of Jerry Donahue, the highly detailed article on the physics of sound, a 5 page spread on the E-Bow, and a great interview with rockabilly legend Roland Janes of Sun Records was icing on the cake! I can remember totally immersing myself in the Collins article (after which I cut out the first page and hung it on my bedroom “Wall of Fame”) and I know that I dug the piece on Janes (in fact, it is definitely this article that clued me into his existence, as well as the background of one of my favorite songs, Billy Lee Riley’s “Flying Saucer Rock and Roll”. I’m sure that I read the rest, but it doesn’t really leave much of a memory. The physics article is quite interesting indeed, and reading it NOW is quite educational, but I think it went over my head three decades ago. 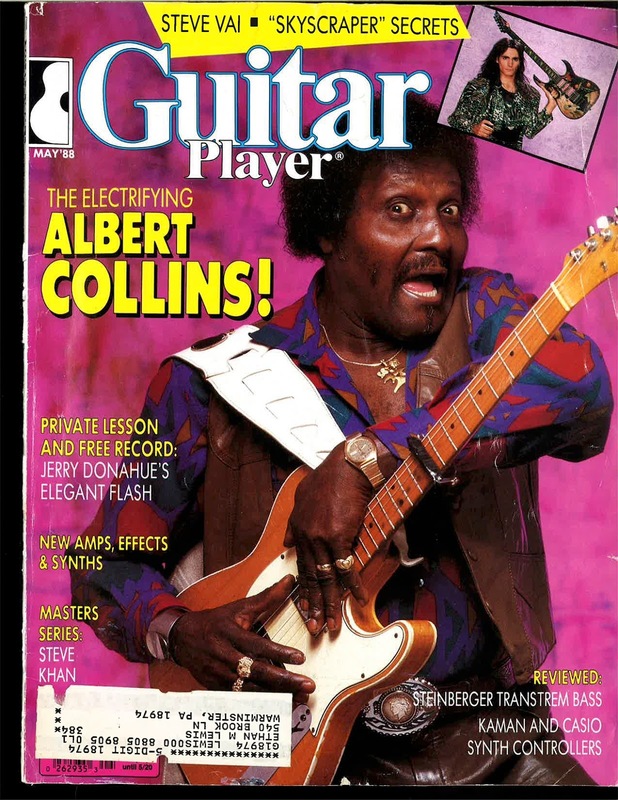 The cover story is by the always reliable Dan Forte (who doubled as “Teisco Del Rey” who wrote about oddball 60’s guitars) and is called “Blues Meltdown: The Power of Albert Collins”. I feel that the article is a bit too “fanboy-ish” at times, but it does a good job of describing the technical aspects of Collins’ sound and how he got his tone. Basically, “he tunes to a minor chord…an F minor triad or a Dm7 flat 5 without the root (F-C-F-Aflat-C-F low to high). Playing essentially in first position at all times he uses his capo to locate the song’s key up and down the neck-hence using only about a third of the fretboard at times.” He also played through a 100 watt Fender Quad Reverb, with volume on 10, treble on 10, middle on 10, bass off and reverb at 4. Ice Pickin’ indeed! Well, they really inspired me, when I went to guitar. I really wanted to do that, and I used to sit down and play all those guys’ records. I met B.B King when I was 20 years old, and he told me “Man, find your own identification. That’ll help you through the world.” I said “Okay”. That’s what I did–I tried to find my own identification. I didn’t want to play like BB. or T-Bone Walker. When you hear younger blues players you must hear a lot of your influence coming out in their playing. Oh yeah. I have pretty good ears, and I can hear it. I hear when Stevie Ray Vaughan is playing like Albert King, a little BB then he goes into Jimi Hendrix, or me. I appreciate a musician being versatile, but I look at them and think “Well, can he get his own identification?” I wonder about that a lot. There’s so much music around, and you get one particular music in your ear, and then you start playing like this other person. I don’t listen to that. Did you concentrate for a long time on your intonation? When you bend, it’s always right on pitch–in contrast to Buddy Guy, for instance, who often bends up to notes that don’t necessarily have anything to do with the key of the song. Well, see, Buddy’s been introduced to Jimi Hendrix. That’s the reason why he plays like that. Buddy really don’t like to play blues no more. He’s into the Jimi Hendrix thing. I’m not sure, but I hope he knows what he’s doing, because, like, if I wanted to play like Jimi Hendrix–I’m noted as a blues player. People say “Hey, man, what you doin’?” Ain’t no more Jimi Hendrix. I try for my intonation to be true. Your style seems a lot closer to rock than a lot of blues players. Is that because you listen to a variety of music? Yeah. I even listen to rap music. But I was listening to a lot of psychedelic music then, starting in 1969, when I really got introduced to it. And I was around Jimi for a minute, when he was 17. I took his place with Little Richard when he left to play with a group called the Drifters. I worked like 15 dates with Little Richard. Me and Little Richard have been friends for years. By doing that, I got introduced to that kind of rock and roll, instead of just playing blues. I was raised up mostly around jazz musicians–horn players like Arnett Cobb, when he was real popular, and Illinois Jacquet, whose father used to play alto with me. What was it like working with Robert Cray on the Showdown record? Oh, it was beautiful because Robert and I played together for three years. I played his high-school graduation party in 1971–that’s when I first met him. The class had to pick between me and Frank Zappa [laughs]. What was it like playing Live Aid? Albert Collins was a great showman with a large band to support in a time when music was changing away from him. His cameo appearance in the Elisabeth Shue movie “Adventures in Babysitting”, his Grammy, and his appearance with George Thorogood at Live Aid in Philadelphia, along with the heroic publicity efforts of Bruce Iglauer at Alligator Records were lifting Collins’ profile, but he seemed to treat an interview with a seemingly awe-struck Forte as a chance to put down the competition. It’s understandable for a 55-year old musician to want to do that, I suppose, but it’s disappointing nonetheless. 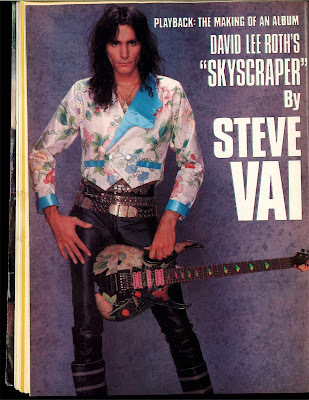 Steve Vai’s article about the recording of David Lee Roth’s second solo effort “Skyscraper” has good information about the record (he does a track by track explanation of how he got the guitar sound for the album) and also about his brand new signature JEM guitar. Years later, it’s hard to think of that iconic instrument being “new”. It’s also hard to remember that Diamond Dave sold a lot of records: “Skyscraper” hit #6 on the Billboard chart and the song “Just Like Paradise” was a #1 hit while “Damn Good” was #2. Personally, this record sounds horrible to my ears now–the title track in particular is like something that could have been on Spïnäl Täp’s “Break Like the Wind”. But Vai’s guitar playing is nothing short of incredible. His melodicism is undeniable, and even on the most far-out whammy excursions what he plays makes sense in ways that Roth’s previous guitar player would rarely manage. The guitars I use are exactly like the ones right off the shelf. That was the concept behind doing the deal with Ibanez. I wanted a guitar that had all my little ideas and idiosyncrasies, such as having 24 frets, and having it dug out so the Floyd Rose is recessed into the body. I wanted to be able to pull up on the bar and have it not go out of tune when you rest your wrist on the tremolo. I wanted to have the volume pots in a certain place and be able to reach high up with the cutaway. I asked Ibanez if they would build me one. A bunch of different companies approached me–all good companies–but nobody really delivered exactly what I wanted, and Ibanez did. Then we talked about mass-producing it, and I didn’t want to put my name on it, because who wants to buy a Steve Vai guitar? What is it going to be in 20 years? It’s better that the guitar actually speaks for itself. It’s a very fine instrument that will transcend my popularity as a guitarist. As time goes on, and other great players come along, I don’t think the guitar will bow out, because it’s a good guitar and should live on. There were 777 green JEMs made and I signed each one of them. Before I go, I’d like to say that when I recorded what was on the March ’88 Soundpage [Ry Cooder & Steve Vai’s Crossroads duel], it was as a piece of music for a movie. The parts that I played on there were purposely played a certain way to coincide with the script–i.e., when Jack Butler loses, he messes up, which is the last lick on the Soundpage. I want people to understand that it was slopped up for a reason. I thought it was a bad choice of music to put on the Soundpage, because there were some great jams that me and Ry did. I also want to express my gratitude to readers for being voted Overall Best Guitarist. I’m very grateful for being recognized. Ok. Maybe there IS some ego there after all! When rockabilly magic was a daily occurrence in the 1950’s at Sun Records in Memphis, guitarist Roland Janes was there. When some of the greatest rock and roll of all time was recorded, Janes was often seated in the tiny Sun studio, whanging out double-stops, burning with his famous trmeolo picking, or doing whatever else was required. Don’t recognize his name? Anyone who’s heard Jerry Lee Lewis’ “Whole Lotta Shakin’ Goin’ On”, Bill Justis’ classic instrumental “Raunchy”, Warren Smith’s “Ubangi Stomp”, Hayden Thompson’s “Love My Baby”, or Billy Lee Riley’s “Red Hot” or “Flying Saucers Rock and Roll” has heard Roland, who estimates that he was on 75% of Sun’s recordings from 1956 into the ’60s when Sun became dormant. Today, largely retired from playing but affiliated with the Sam Philips Recording Studio in Memphis as an engineer and producer, Roland Janes reflects on his days at Sun with a mixture of pride, bemusement, and dry, self-deprecating humor. Janes, who died in 2013, comes across as a humble, interesting man who understands the place of the guitar as PART of a song, not the POINT of the song. At one point he observes “[p]robably the greatest talent I had, if I had any talent, was the fact that I was capable and smart enough to know when to play, and when not to play–and what to play in order not to get in somebody’s way. With Jerry Lee, he was the show, the performer, the star–the way it should have been–and anything that I played should complement him. That’s probably about the limit of my talent. Working with Jerry Lee, if you’re going to take a solo of any kind after he gets done playing, you damn well better come up with something different or something good.” Every guitar player in every band should have these words written on the inside of their guitar cases to see them and reflect on them before every gig. 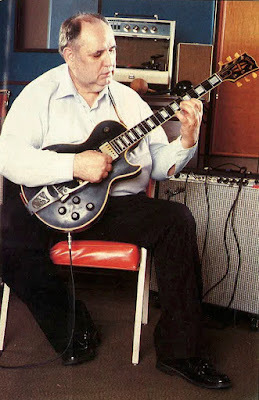 While the picture above shows Roland picking the Gibson Les Paul Custom he used with Jerry Lee Lewis, gear wise, Janes reveals that his main guitar at the time was a “sunburst, maple neck Fender Stratocaster” that he rewired to allow him to play the neck and bridge pickups simultaneously. I’ve done the same on my own Strat, and it’s a really good, useful sound. He says he got the idea from Nashville sessionman Reggie Young, and it’s great to see that even in the early days players were modding their gear in pursuit of tone and playability. Pretty cool! While this issue did not grab me as much upon re-reading it, there was still lots to learn and lots to think about. 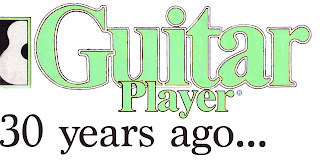 Stay tuned for next month’s issue, featuring Frank Gambale, Ted Nugent and Martin Barre–until then, keep on picking!